I must share with you two really profound – and radically contrasting – lessons in Economics I learned today. One, from Congress President and Prime Minister-aspirant Rahul Gandhi; the other, from my colleague-become-friend of some 24 years, Rickshaw and Thela (wheelbarrow) Operator Suresh. Rahul’s insight really made me think, O gracious reader. In a weird and woolly way, it kind of makes sense, no? Only one thing about Rahul’s economics troubles me: Rahul’s plan to create 22 lakh government jobs (+ 10 lakh quasi-government jobs). Since the 7th Finance Commission, even the lowliest central government employee in India starts with salary of Rs 18,000 per month; that’s Rs 216,000 (2.16 lakhs) annually. Which means that, even assuming that every one of Rahul’s 22 lakh new government employees draw only this minimum salary, the annual salary bill for these worthies will be Rs 47520,00,00,000. To me it seems a hell of a lot of money, just for the sake of having 22,00,000 more leech-like sarkari babus making life miserable for you and me and all other honest, tax-paying citizens. Especially so, because that Rs 47,520 crores is going to be forked out every year by honest, long-suffering income tax payers like you and I! In mid-2018, Suresh’s five year-old son was diagnosed with cancer. Thanks to the chemotherapy and the excellent medical care he received and continues to receive at the Delhi Government’s Lok Nayak Hospital, the child is now recovering well…but for Suresh and his wife, it has been a year of indescribable anxiety, physical and mental trauma….with the financial pressures (to raise over Rs 2 lakhs for the treatment, when there was no time to even ply his rickshaw or thela) only adding to their stress. Suresh’s words, too, made me think. Unlike Rahul, who has a team of illustrious economic advisors, Suresh has none. But Suresh has something that I think counts for much more: common sense, that comes from experience of hard ground realities. I’ll go with Suresh’s insights into economics. Ever since India successfully conducted its anti-satellite (A-SAT) missile test, our crass netas have given political twists to the event that would make a boa constrictor straighten in envy. Considering the kinds of comments that they and their acolytes are making, and with Lok Sabha polls looming over the horizon, we, the wee people, have good reasons to worry about whether our newly elected MPs will even understand, let alone be capable of handling, critical strategic issues such as space technologies, missile defense, nuclear deterrence and the like. But there is hope! Unconfirmed and officially disavowed sources reveal that the Lok Sabha Secretariat is alive to the challenge, and is preparing a series of small booklets on science and technology for the enlightenment of our newly-elected MPs. ‘Polar’ or ‘Poll-ar’ satellites are rather unstable, and remain loyal only so long as their leader has a chance of winning in polls. ‘Jio-synchronous’ satellites, also known as ‘Jio-stationary’ satellites, are more stable and loyal, because they are held securely to their leader/party by the attractive gravitational forces of G, 2G or even 4G. Space Debris: The countless pieces of metal, plastic, composites and affiliated junk that are now orbiting the earth, and that have resulted from the break-up of old satellites launched by different countries during the last 50 years. About 97.9% of all the space debris is ‘clean’ debris, because it comes from NASA satellites sent up by USA. The remaining 2.1% of the debris is ‘dirty’ debris because it comes from Indian and Chinese satellites. Escape velocity: The very high velocity with which politically connected fraudsters and affiliated crooks escape from India to other countries when a new government takes over in Delhi. ‘Relativistic’ velocity (also known as ‘Maxis’ or maximum velocity) is the highest attainable escape velocity, usually achieved only by crooks who are close relatives of political leaders. Global positioning system (GPS): A wonderful technology that helps government to keep track of the escaped crooks, and guide them to safe havens when necessary. Inertia: Describes the tendency of a government to remain forever in a state of supreme inactivity; or if roused into motion (usually by sting operation), to continue moving aimlessly along a fixed path to nowhere until halted by the ‘fictional’ force of Opposition. Launch window: The auspicious interval of time for a new politician to launch her/his political career by filing nomination papers for Lok Sabha or assembly elections. Launch window is determined by specialists in astral science called ‘astronauts’. The term astronaut itself is derived from the ancient Sanskrit: astra-nath—‘one who rules over stars’ (Ref: Goru Gauswamy et al., 4300 BCE. Space Explorations. Muttal Press: Takshashila). Re-entry vehicle: Pathway for political deserters to return to their parent (or grandparent) party. As re-entry usually generates intense heat from party rivals, re-entering politicians require rings of protective coating. Hence, the re-entering politicians are popularly called ‘turncoats’. Star wars:Spectacular electoral battles waged between stars affiliated to Bollywood, Mollywood, Tollywood and other non-Dawood studios. If firearms such as Shotguns are used by the star-candidates during poll campaigns, we call them ‘shooting stars’. Sometimes, the winning stars are given Cabinet portfolios, in which case we call them ‘acting ministers’ if they turn up for work; or else, ‘deadwood’. Warhead: An especially strident jingoist, usually seen on TV talking-head shows calling for nuclear attack on neighbouring nations, political opponents, and occasionally, neighbouring panelists. Lawyer: Doctor, before you signed the death certificate, did you check the patient for pulse? Lawyer: Did you check for blood pressure? Lawyer: Did you check for breathing? For heartbeat? Lawyer: (triumphantly) So, doctor, do you admit it is possible that the patient was alive when you signed his death certificate? Doctor: Well…let me put it this way. The patient’s brain was sitting in a jar on my desk when I signed his death certificate. But I guess it’s possible he was alive; indeed, he might even be practicing law somewhere. I, dear reader, have no doubts at all about the IAF strikes on Balakote and their impact on the Jaish cadres sleeping in the targeted buildings. The several thousand kilos of penta-erythritol tetranitrate carried by those Spice missiles and thrust through the roofs of the buildings would have wreaked horrific destruction when they went off within – ripping apart metal, concrete, brick, wood, human flesh and bone. Unlike the doubters as well as the gleeful war-mongers in their TV studios and editorial rooms, I do NOT want proof on how many JEM personnel were killed, or how many brooms and hoses were needed to clean up their remains. Only the post-mortem of the deceased JEM cadres remains to be concluded. The Coroner’s Court is noisy. Two groups among those present—one Indian, the other Pakistani—are particularly strident. But strangely, both groups are screaming more or less the same things. How can Indians and Pakistanis be united in screaming against the Indian government? The Pakistani group – comprising the Pak establishment, ISI, army and media – hates India in general and the Modi-led Indian government in particular. This is sad, yet understandable. The Pakistani group’s hatred has been stoked by the IAF strikes on Balakote, which have gone down well among the Indian public in an election year. The Indian group – comprising Congress, CPM, TMC and other Opposition parties, as well as large sections of Indian media – hates the Modi-led government. This is sad, yet understandable. The Indian group’s hatred too has been stoked by the IAF strikes on Balakote, which have gone down well among the Indian public in an election year. Who, then, O long-suffering reader, can we trust to show us, tell us, the truth? I don’t know about you…but I’ll stick with the Indian armed forces. Be at peace, O deceased Jaish men. Unlike your Pakistani army handlers, I at least acknowledge that you once lived. Whether the ‘Interim Budget’ presented by acting Finance Minister Piyush Goyal was actually interim or not is immaterial – as immaterial as the benefits you and I will receive from the Budget. 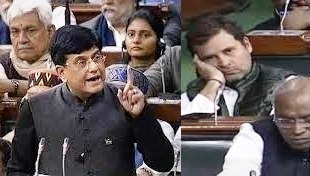 Far more tangible was the utter bewilderment on the face of Congress President Rahul Gandhi during Goyal’s speech. Clearly, the poor man was quite flummoxed by the barrage of economic spiel, financial terms and affiliated data Goyal dished out, tera-flop by tera-sop. Following the budget speech, we staggered up to the terrace and espied a piece of paper gently floating in from the general direction of Parliament Street. Grabbing it and smoothing it out, we discovered it to be a page torn from a standard-issue Lok Sabha jotting-pad. The page was filled with writing, starting with a four-line piece of doggerel! We transcribe below, O faithful reader, the lines from this solitary page. We can only guess at the identity of the author – perhaps a cynical Congress or CPI(M) Member whose heart is yet in the Right, or even Left, place? With general elections a couple of months away, and with strong indications that our Mahagathbandhan might well form the next government with Rahul-ji as prime minister, surely we must all try and help Rahul-ji understand some common terms used in connection with the budget? Appropriation Bill: This is a bill of receipt, or challan, given to you by team from Income Tax Department, Enforcement Directorate or CBI after they raid your home and/or office and appropriate assets disproportionate to your known sources of income. [Always remember: when raided, insist on Appropriation Bill]. Balance of payments: Denotes the difference in total value between various payments into and out of India over a certain period of time on account of kickbacks on defense equipment, hawala transactions and so on, through legally disapproved channels such as Channel Island companies. Fiscal policy: Derives from the vision of Congress fore-fathers, fore-mothers and fore-others, of an India where our youth – young and old alike – are strong and muscular, that is, fiscally fit. Fiscal fitness is especially important during election campaigning. Today BJP makes tall promises to set up infrastructure for fiscal fitness such as gyms, sports stadiums and so on. In practice, however, these promises are never kept and the money allocated disappears without trace in ghotalas and goshalas, leading to a weak fiscal condition in people known as fiscal deficit. Gross Domestic Product (GDP): Although it might sound gross or unpleasant, GDP is a vital measure of the overall garbage output from the entire domestic or household sector in India. As household prosperity increases, so too does household consumption of junk food and junk goods, and therefore of household garbage output. This is famous Garbage In = Garbage Out principle. Hence, high GDP growth is good because it means India’s economy is growing. Inflation: Describes the tendency of the BJP government to make exaggerated claims about everything, including the size of Narendra Modi’s chest. Affiliated terms are deflation and recession, manifest in shrinking chests of BJP members upon losing in successive state assembly elections. Public account: Refers to the public admission made by a high-level politician or government servant who is accused of swindling public money, during a court hearing that is open to public. When the hearing takes place in Supreme Court or Delhi High Court, the public admission is known as capital account. P.S. : We offer a reward of Rs 10,000 in non-demonetized notes to anybody who can trace the remaining pages of this invaluable document. The idea of a Congress Love Campaign fills us with delight. Almost as much delight as Prime Minister Modi must have felt in the Lok Sabha that fateful July day, when, after Rahul delivered a passionate speech that blended incoherence, irrelevance and insolence in the proportion of 40:30:30, the youthful 49-year old Congress president suddenly and unexpectedly announced in ringing tones his boundless love for all humanity, including even Modi; declared his resolve to convert all Indians, including even the BJP members, to become loving Congress acolytes; galloped across the hall, stood over the bewildered Modi and commanded him to rise and receive his (Rahul’s) hug; and when Modi failed to oblige, bent down and clasped the PM, unasked, in a strong and presumably loving embrace. We witnessed it live, gentle reader. We choked; we nearly wept; so overcome were we with mirth. We respectfully urge Rahul and the Congress to build on Rahul’s infantile performance, and to focus their electoral love campaign on mobilizing the young voters of tomorrow—the younger, the better! With this principle in mind, we offer the following visual as our humble contribution to the Congress creative team’s ’ efforts. A small baby step that, we hope, will enable Rahul to assume charge of India and spread his message of Universal Love and Hugs. Possible poster for Congress’ 2019 campaign: Catch ’em young! It’s that happy time yet again! When, inspired by a cerebellum that is as overflowing with originality and creativity as Rahul Gandhi’s is, I reach into the dusty shelves of decade-old works and re-inflict them upon my hapless and rapidly dwindling readership. The reason for committing this latest atrocity on thee, O dear and innocent reader, is to defend the initiative taken by Sri Sri Ravishankar—the Indian spiritual leader, head of ‘Art of Living Foundation’, popular among Hindus, Muslims and other communities for his teachings, cosmetics and other rejuvenating products—to engage with Muslim community leaders in an effort to settle the gangrenous, 30-year-old Ram Mandir/Babri Masjid dispute out of court. Sri Sri’s initiative is being met with violent opposition from many rabid, self-styled leaders of Hindu and Muslim communities. An important disclaimer: I am no ‘follower’ of Sri Sri. In fact, I have severely criticized him in speech and in writing (and still do) for hosting his ‘World Culture Festival’ on the Yamuna floodplains in March 2016; an event that led to the de-vegetation and flattening of a vast area on the floodplains. The repercussions of that ecological assault are still being directly and painfully felt by the undersigned and other residents of East Delhi in the shape of year-round attacks by assorted species of mosquitoes (all of them entirely secular in their choice of prey); because with the denudation of bushes and scrub on the floodplains, these bloodsuckers have lost their traditional breeding and brooding grounds on the said floodplains. But I still believe Sri Sri and his associates, Hindu and Muslim, are doing the right thing, indeed a noble thing, by trying to solve this hideous mess over Mandir vs. Masjid; a mess that’s led to mass murder in the past – and threatens mass murder in times to come. If Sri Sri succeeds in his mission, I am even willing to forgive him for the mosquito bites he has caused me, and countless others of every faith. And so, in good faith, I present here an article I wrote for the edit page of Indian Express nearly 15 years ago, when the Kanchi Shankaracharya launched an identical ‘reconciliation’ initiative in 2003—and was met with the same violent opposition and ridicule by so-called leaders of Muslim and Hindu communities. In fact, the man was even charged with murder in 2004, arrested, jailed and tried…only to be absolved of all charges and released in 2016! You’ve taken on formidable forces, Sri Sri! Victory be thine: Jai Vijaye Bhava! It is heartening that the Muslims of Faizabad-Ayodhya see the Kanchi Shankaracharya’s initiative to resolve the Ayodhya tangle as a ‘‘good beginning’’ (‘Local Muslim leaders find some hope…’, IE, June 11). Ironically, the sincerity of the Kanchi seer’s efforts is proven conclusively by the heated opposition he has drawn from the lunatic fringes — both Hindu and Muslim! Organisations such as the Vishwa Hindu Parishad, Bajrang Dal, All India Babri Masjid Action Committee and Sunni Wakf Board will never solve the Ayodhya problem because they are the problem. While the common citizenry of both faiths only want peace and harmony, these bodies comprise bigoted, self-serving individuals who not only claim to represent their religions, but have obtained enormous fame and political power precisely by keeping the Ayodhya issue simmering. Any solution to the dispute would threaten their very existence. Quite naturally, then, they have resisted, and will resist, any attempted solution. Remember how the Kanchi seer’s initiatives for dialogue were rubbished by both the VHP and BMAC in 2002? Let us face it: the Ayodhya issue will not be resolved by the much-bandied ‘‘court decision’’ (assuming it ever comes). It will be solved only by mutual understanding between the Hindu and Muslim communities at large. After all, any court decision will be interpreted in only one of two ways: as favouring the building of a temple, or of a mosque. If the verdict favours a mosque, the VHP et al. will shriek that Hindus have been ‘‘betrayed’’. On the other hand, Muslim bodies such as BMAC will become redundant at a stroke; their very raison d’etre would be gone! So the VHP and similar self-styled ‘‘Hindu’’ bodies will incite violence across the country; the members of BMAC and similar ‘‘Muslim’’ bodies, threatened by redundancy, will find fresh reasons to project themselves as ‘‘defenders of the faith’’; the outcome will be chaos and bloodshed. And what if the verdict favours a temple? Alas, these dreadful organizations would merely switch roles. The BMAC would shriek that the Muslims have been betrayed, the VHP would assume the mantle of ‘‘defenders of Hinduism’’, and chaos and violence would follow. The only way to unravel the Ayodhya tangle is to shun any political, executive or judicial involvement — precisely what is being advocated by the Kanchi seer and by the Muslims of Faizabad-Ayodhya. Let us not be misled by the rabble-rousers, Hindu and Muslim, who have no religious or intellectual authority whatsoever to represent the laity; who number no more than a few thousand; yet who have held a nation of one billion hostage to their narrow-minded agendas for decades. Let us leave it to learned men and women of both faiths to sit together and agree on a simple way by which the country can finally discard the communal baggage of the past. A famous pianist accidentally bruised his finger severely minutes before a major performance. Despite his heavily bandaged finger and pain, he insisted on playing as scheduled. The Master of Ceremonies was aghast. Having failed to dissuade the pianist from performing, he sought permission to inform the audience about the accident, and that the maestro would perform nevertheless. “You shall do nothing of the sort!” cried the maestro. “Why, tonight I might perform better than I ever have or ever shall in my life…yet, remembering your words, the people in the hall will shake their heads and look at one another and say: ‘The maestro played quite well tonight…alas, if only he hadn’t injured his finger, how much better his performance might have been!’ No, no, I shall play to minds unclouded by irrelevant sympathies for my finger!” And so he did. The performance was brilliant. Consider, gentle reader, the case of Ram Nath Kovind, nominated for the post of President of India by the ruling NDA government. The entire Indian media sees Kovind as nothing more than a ‘Dalit’; indeed, barring a precious few noble exceptions, our journalists see Kovind’s nomination as being based on this single loathsome argument: by nominating Kovind the Dalit, the BJP-led NDA is assuring itself of Dalit votes in the 2019 Lok Sabha polls. Worse, the media couches its twisted presentations in the enervating, patronizing gobbledygook of political correctness. One example is an editorial which brightly suggests that there is ‘rich symbolism’ in the prospect of a Dalit president [click here to read]. Such an outlook views every Indian through the narrow, warped lenses of caste, religion, ethnicity, language—lenses that are selected and discarded as per convenience and context to make this or that argument. It is this very vision that fractures Indians into thousands of mutually hostile social groupings; that continues to prevent the Dalit from ever shedding his/her ‘Dalit identity’ (our intellectuals have even coined a term for this: ‘dalitness’); that indeed drove Rohith Vemula, the student from University of Hyderabad, to take his own life in despair. When K R Narayanan, and later APJ Abdul Kalam, assumed the office of President, great swathes of us ‘educated, urbane’ Indians did not, or could not, recognize or celebrate the fact that these were self-made men of humble origins, who were supremely qualified for the highest office because of their humaneness, moral fibre, formidable intellects and scholarly achievements. All we saw was that a ‘Dalit’ and ‘a Muslim’ had become President! And thus we diminished them. …as we now diminish Kovind. As we now diminish Meira Kumar, nominated by the Opposition against Kovind. Thus do we diminish, degrade ourselves. Can you spot the Muslim? the Hindu? the Brahmin? the Dalit? This narrow-minded vision of humanity has cursed India and its populace for thousands of years; like a long-lived radioactive poison, it has spread across the country, seeped into our educational policies, our political and governance structures, our minds, our deeds. The only cure is incredibly simple: to awaken to, and accept, the simple, scientific truth that beneath our many-hued skins and assumed symbols of religious, caste, and other forms of social exclusivity, we are all simply and equally human. It is a truth that frightens the hell out of the bigots among us, the casteists, communalists, racists. But it brings incredible joy…for we truly then see the One in All, and All in One. Nothing religious about that, no?